The Coleman Lakeside Tent is one of the larger tents that Coleman makes...billed as an 8-person tent, from experience this tent will most likely be comfortable for 4-5 people with gear. While it is a large size camping tent and is not a backpacking tent, the Coleman Lakeside tent is set up sort of like a backpacking tent in the way the door is placed on one of the shorter sides of the tent rather than the long side, as in most family tents or other Coleman tents. Although this is not one of Coleman's most popular tents, this tent still has many of the great features that makes the Coleman tents so popular overall. To keep you comfortable and dry, this tent has Coleman's Weathertec system with all of its features designed to keep the contents of the tent, including you, your family, and your gear all comfortable and dry. The large rainfly extends over the door and windows, also to keep the insides of the tent and its contents/inhabitants dry. Mesh vents in the door, windows, and "skylight" allow for ventilation in this tent...does the Coleman Cool Port..which looks like a little doggie door, and yes, people use it as such too..but which also allows extra air movement into the tent at ground level to make you more comfortable. You can also use this port to access gear you might want to store outside your tent rather than in it. The Coleman Lakeside tent also has a built-in door mat to help keep out dirt and debris, a viewing skylight for those beautiful starry cloudless nights when you are not expecting rain, and a gear loft and storage pockets for keys, books, flashlights, a tent fan, etc. Finally, don't forget Coleman's standard features such as the shock-corded poles, setup instructions sewn into the bag so you don't lose them, and convenient separate storage bags for your tent, tent poles, and stakes. Looking for Large Tents? This is it! Size-wise the Coleman Lakeside tent measures a HUGE 15 feet long by 10 feet wide, making it perfect as a large family camping tent. It stands 73 inches high in the center, which is 6 feet 1 inch, a comfortable height that allows most people to easily stand upright when inside of it. 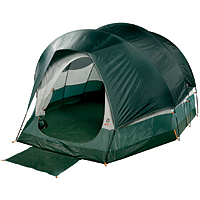 The popular Coleman Sundome Tent, perfect for couples...or camping with teenagers who want their own tent. Looking for other Coleman large family tents? The Coleman Family Dome Tent can comfortably sleep a whole family. The Weathermaster and Weathermaster Elite tents are roomy cabin tents you can stand straight up in. A little smaller than the Coleman Family Dome tent, Large-Sized Coleman Sundome Tents are roomy, easy to put up, and some of the most popular Coleman tents. Still smaller but still extremely popular Coleman Sundome Tents are the perfect size tents for camping singles and camping couples.